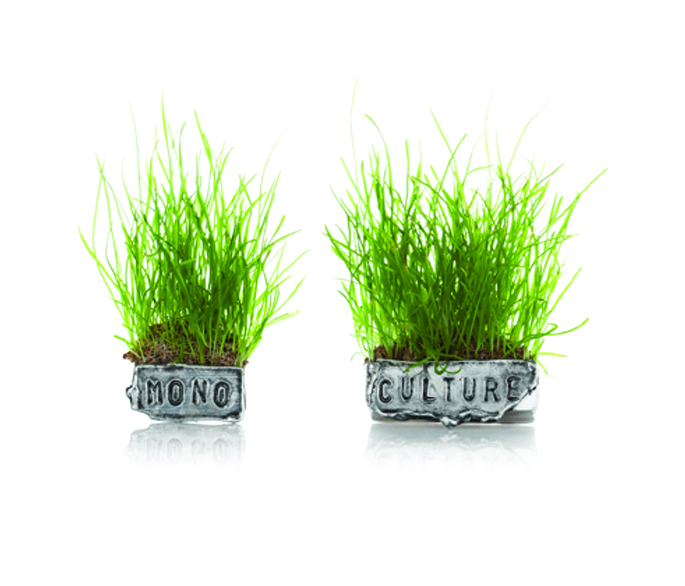 Clare Poppi, MonoCulture Brooch Series, Photography by Sam Wright, Talys Photography. Clare Poppi creates unique, environmentally responsible jewellery and metal sculptures using recycled metals and ethically sourced materials. Her primary practice is in jewellery and metal-smithing, focusing on sustainable design and wearable art. Feeling there to be a lack of understanding about the harmful impacts of jewellery production, Clare established the label Small Green Leaf in 2013 with the intent of promoting the ideals of eco-jewellery to the public on a number of levels. Small Green Leaf sets out to not only educate consumers about these problems but to provide them with the opportunity to purchase ethically produced, locally made jewellery. In terms of the future, Clare explains the need for interactivity – “Now that eco-friendly studio techniques are so firmly embedded in my practice, I want to explore new ideas while still basing my physical practice on ethical techniques. I want to look at more ways of involving the wearer of my jewellery in its final outcomes whether that’s growing pieces or a completely new process I haven’t discovered yet”. This is where Clare’s Growing Jewellery Project comes in as not only a major aspect of her ethical practice but one which intends for the jewellery to form a connection between the grower and nature, and when worn, the jewellery is a visible statement of environmental awareness and provokes conversation and dialogue. This involves her sending out growing jewellery to participants (locally and internationally) who look after the pieces for a time and document their experiences on her blog. With the splash of green against the hard metal in her illustrated pieces, Clare explains “I think I will always be interested in the transient, the ephemeral and ways to capture that in something so solid and immutable as metal”. Clare has had a constant string of exhibitions with one particular highlight being a 2011 group show entitled ‘Green Nation’ which was curated by Kirsten Fitzpatrick and saw exhibitors produce work of all things growing. Clare explains, “From giant glowing planter boxes to light bulbs containing live plants I was proud to be part of an exhibition which so keenly embraced environmental concepts and to discover so many other artists working with similar themes and materials as me.” In terms of the future, Clare explains the need for interactivity – “Now that eco-friendly studio techniques are so firmly embedded in my practice, I want to explore new ideas while still basing my physical practice on ethical techniques. I want to look at more ways of involving the wearer of my jewellery in its final outcomes whether that’s growing pieces or a completely new process I haven’t discovered yet”. This is where Clare’s Growing Jewellery Project comes in as not only a major aspect of her ethical practice but one which intends for the jewellery to form a connection between the grower and nature, and when worn, the jewellery is a visible statement of environmental awareness and provokes conversation and dialogue. This involves her sending out growing jewellery to participants (locally and internationally) who look after the pieces for a time and document their experiences on her blog. With the splash of green against the hard metal in her illustrated pieces, Clare explains “I think I will always be interested in the transient, the ephemeral and ways to capture that in something so solid and immutable as metal”. POSTSCRIPT: Clare has commissions and awards to her credit and was a finalist in the 2012 Noosa Biosphere Art Prize, the most recent iteration of which is covered in the article ‘Dressing the Part’, in this edition of eARTh e-mag.